IR Beacon click is a mikroBUS™ add-on board with an array of nine high speed infrared emitting diodes. It functions as a beacon device, transmitting infrared rays in a wide angle, which can be detected by nearby infrared receivers (such as the one on IR click). Each of the nine VSMB2948SL diodes have a transparent plastic package that serve as tiny lenses. The IR wave has a half intensity angle of ±25 degrees. The diodes have high radiant power and intensity with a peak wavelengths of 940nm. IR Beacon click is suitable for high pulse current operation. 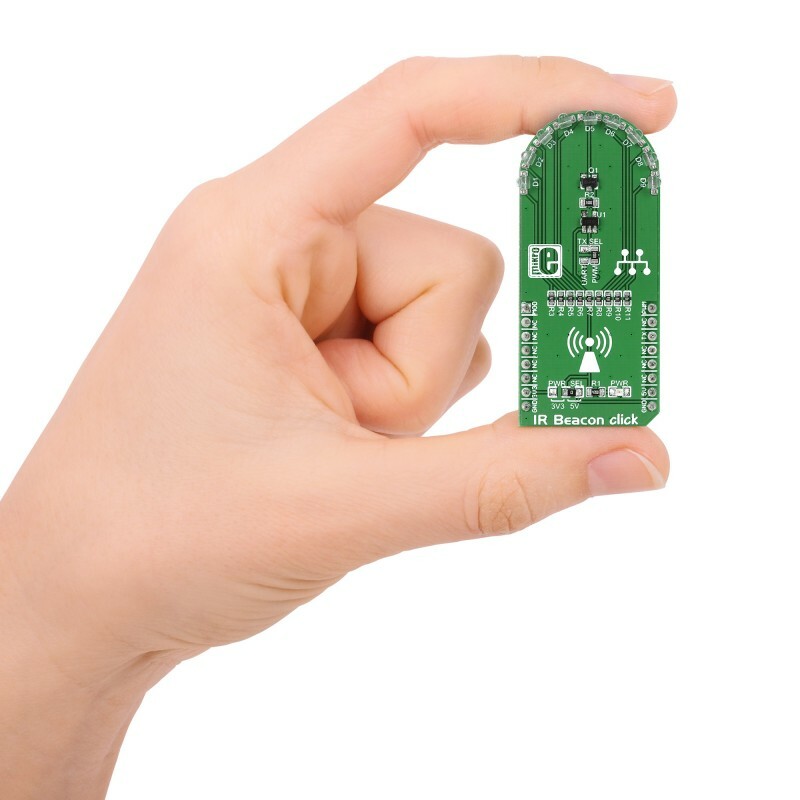 The mainboard MCU drives the infrared diodes through the mikroBUS™ MOD pin, providing a carrier signal (which can be modified to match the frequency of the receiver). Either UART or PWM can be used to transmit a signal to a target receiver (specified by the position of the TX SEL jumper is in the middle of the board). The range is up to half a meter. 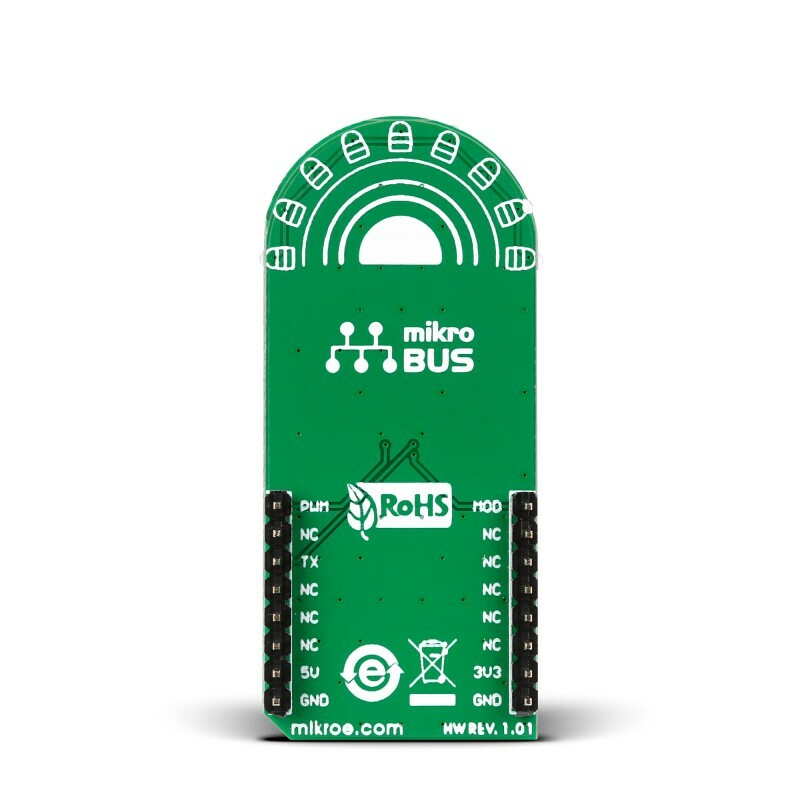 You can increase it by stacking multiple IR Beacon clicks onto a same mikroBUS™ socket. 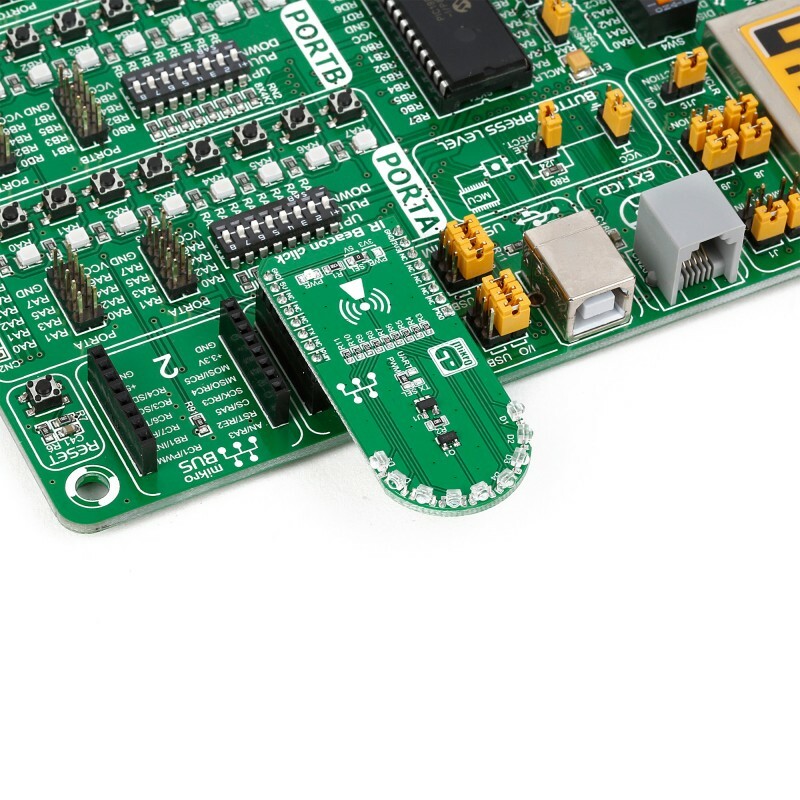 The board can use either a 3.3V or a 5V power supply. Applications Remote controls. Also, it’s ideal for robot competitions that require two robots to communicate with each other (pair with IR click). 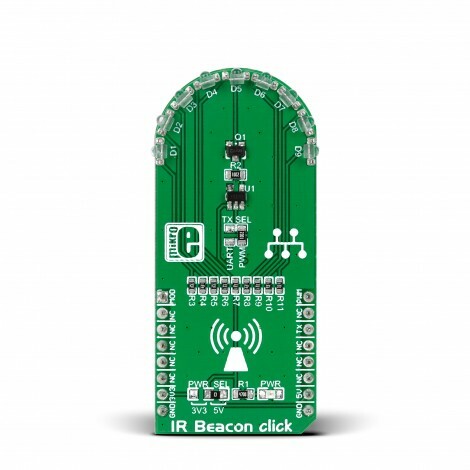 IR Beacon click is a mikroBUS™ add-on board with an array of nine high speed infrared emitting diodes. It functions as a beacon device, transmitting infrared rays in a wide angle, which can be detected by nearby infrared receivers (such as the one on IR click). This code demonstrates how the IR Beacon click sends IR signals depending on the PWM frequency.